Stow the third seat belt buckles. 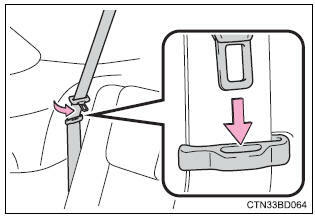 Pass the outer seat belts through the seat belt hangers and secure the seat belt plates. This prevents the shoulder belts from being damaged. Make sure that the seat belts are removed from the hangers before using them. While pulling the straps, fold down the seatbacks. Lift up the seatbacks until they lock. Pull the straps and raise the seatbacks until they lock. After using either strap, use the velcro on the end of the strap to attach it to the seatback. 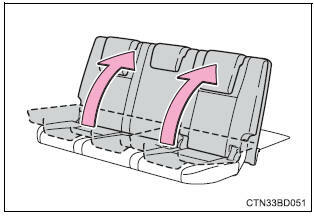 Do not fold the seatbacks down while driving. 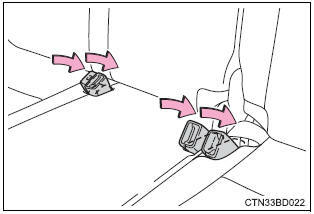 Stop the vehicle on level ground, set the parking brake and shift the shift lever to p.
Do not allow anyone to sit on a folded seatback or in the luggage compartment while driving. Do not allow children to enter the luggage compartment. 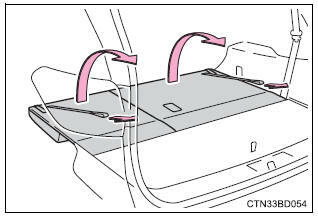 Do not fold down a rear seatback when there are passengers sitting in the rear seats or when there is luggage placed on the rear seats. Be careful not to catch your hand when folding the rear seatbacks. Be careful not to get your hands or feet caught in the seat. 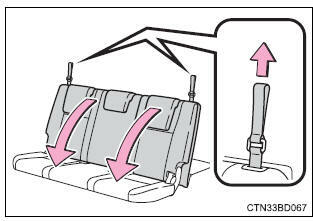 Make sure that the seat and seatback are securely locked in position by lightly rocking them back and forth. Check that the seat belts are not twisted or caught in the seatback.